I hope you all had a wonderful week and weekend. Today I'm sharing one last Christmas card before I pack away the pretty paper and take down all my twinkly lights. This one is made using papers from Canvas Corp Brands. Even though my term as a CCB Crew Member is over, I will be using their amazing papers for years to come! The snowflakes are Penny Black, the reindeer is Frantic Stamper, the flowers are Wild Orchid Crafts, the snowflake flourish is Memory Box, the snow and glitter are DecoArt and everything else is from my stash. It's been raining here all week and there's no snow to speak of, so I took a trip up north so I could get a little taste of winter. There was four feet of snow up there and the world was covered in ice! It was absolutely glorious!! 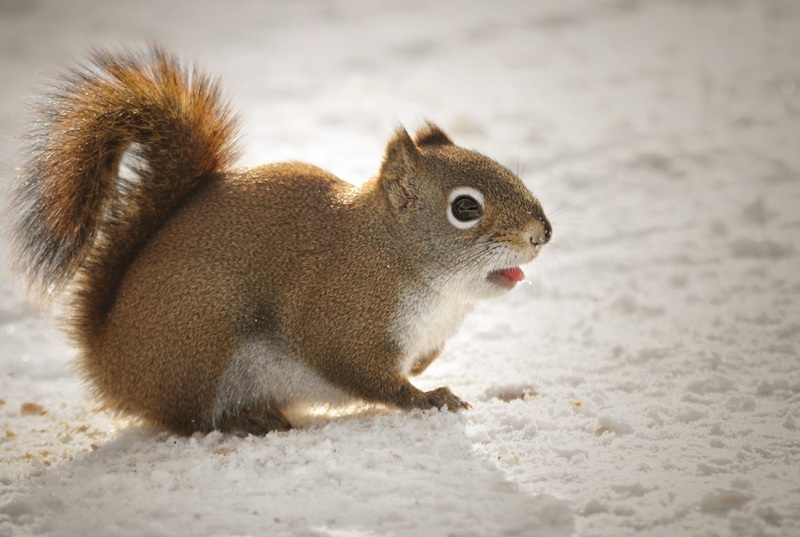 I didn't see any grey squirrels up north, I did however run into this little red squirrel. He was so adorable, but he ran away quite quickly when I stepped in to get a close up. "UGH! Now I know why my Mamma told me not to eat yellow snow!!" 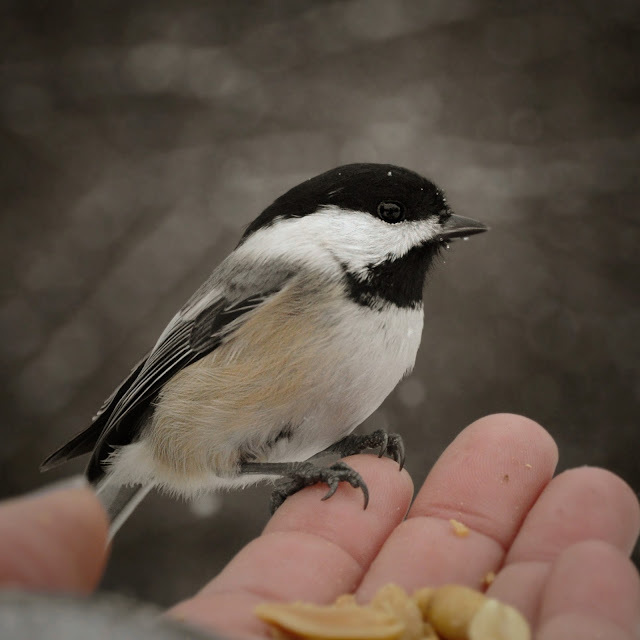 I saw some Chickadees up north, but they sure didn't want anything to do with eating out of my hands, so I had to come back home for a little one on one with my local wildlife friends. This is MISSY, she hangs out at the lake and is only starting to get used to me. She normally just watches from behind a tree to see what I am up too. So cute. "OK, so it turns out, it's NOT easier to go through the reeds!!" I am so glad that my good friend KAREN still comes to visit. She is the last of the my original gang from when I moved in last year. She is sweet as ever and always poses nice for the camera! That's it for today. Thank you for stopping in and for all the amazing comments. If you have any questions or interesting tidbits about today's wildlife, please let me know. Another Faboulas card pamellia. With those frosty colours looking forward to your spring cards soon I hope. Nice pice with the snow scenes and birds. Hope you have a lovely holiday break. Oh your card is stunning... I love the berries peeking out and the colours are so pretty! I adore your photos ... You are such a brilliant photographer! Gorgeous card again! Beautiful design, love the combination of colours and I'm always amazed at how many wonderful details you can include on one card! Brilliant photos as usual, always a treat! Wonderful card as always, Pamellia! Love all the things tucked into the layers. 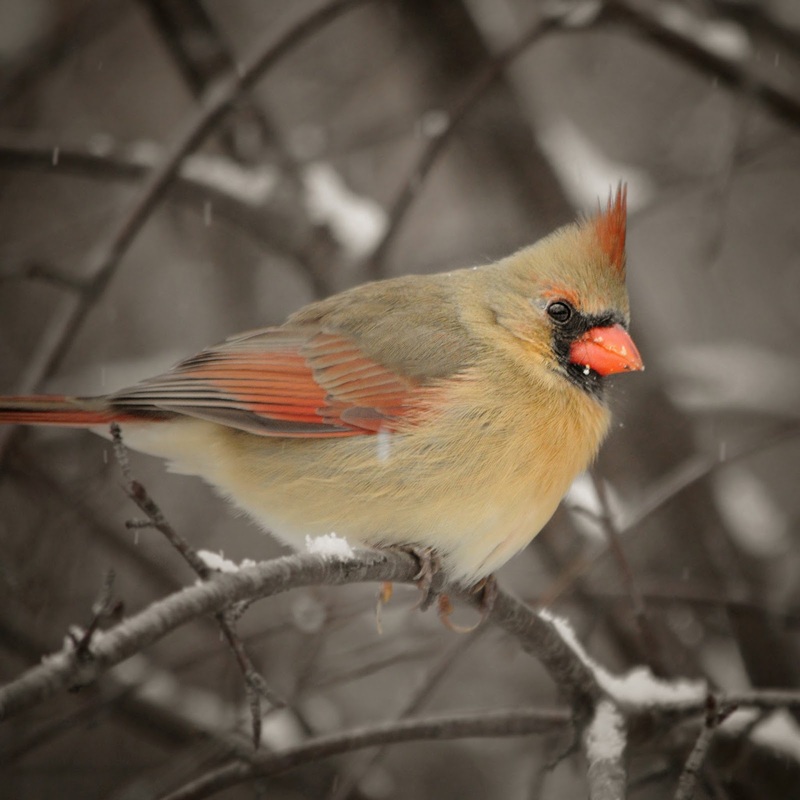 Thanks for the wildlife and out door photos--love seeing winter as I always picture it should be! Pamellia, your card is beautifully layered and I love it! We moved to Wisconsin and now we also have a variety of yard birds and critters. 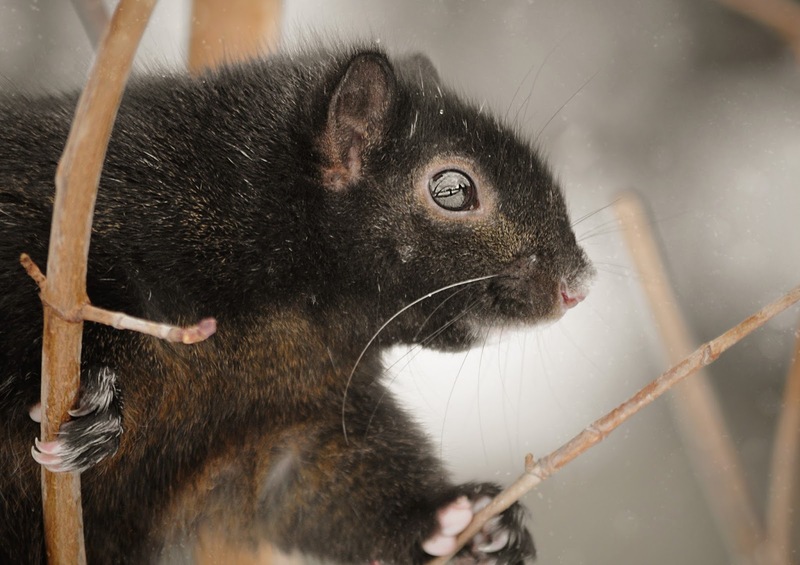 For the first time ever, I have seen a black squirrel and he/she comes to our deck to enjoy peanuts! Great photos! Thanks so much Kate. 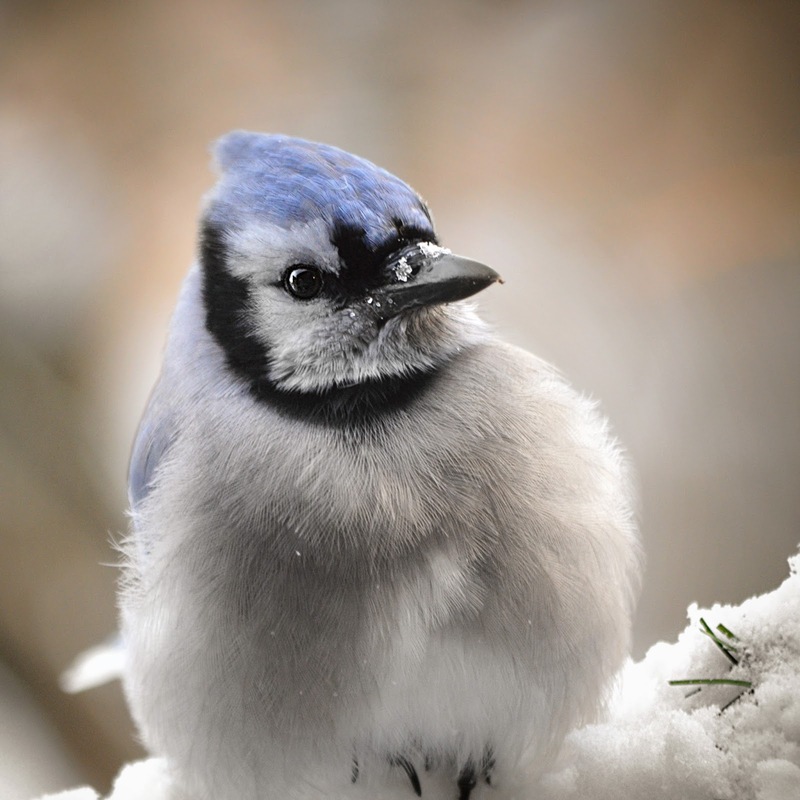 Not a cardinal, it's actually a Blue Jay. A common bird in this area, visits year round. They are quite the characters and I enjoy photographing them!! Gorgeous! Love the layers, the detail and the colors! A stunning card! 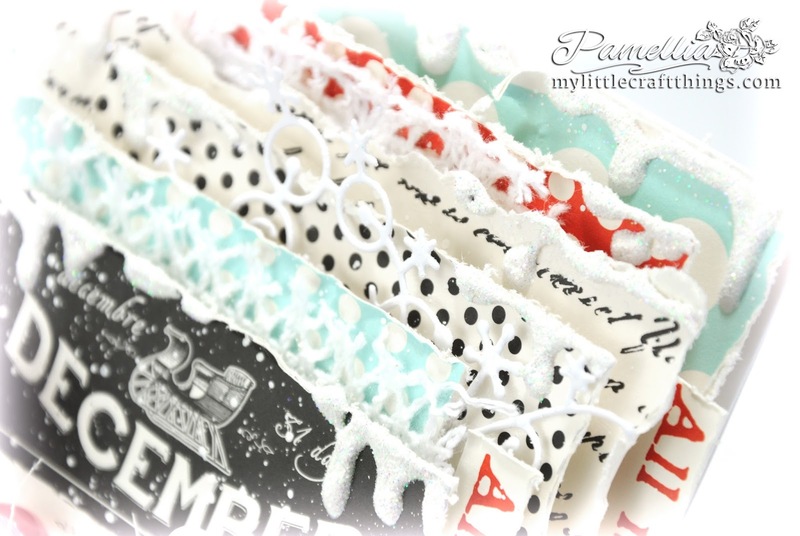 Stunning combo of papers, with that black, red, white and the lighty aqua colours! So frosty and sweet! Fabulous distressed edges of the layers and embellishments! 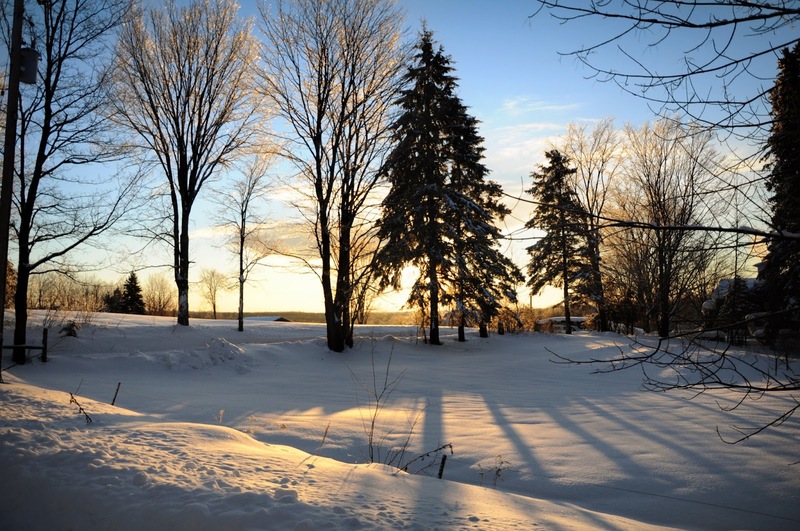 Your panorama shot is a delight, such a magical snowy world! And the little birds and squirrels make always me smile! Miss is so cute!!! 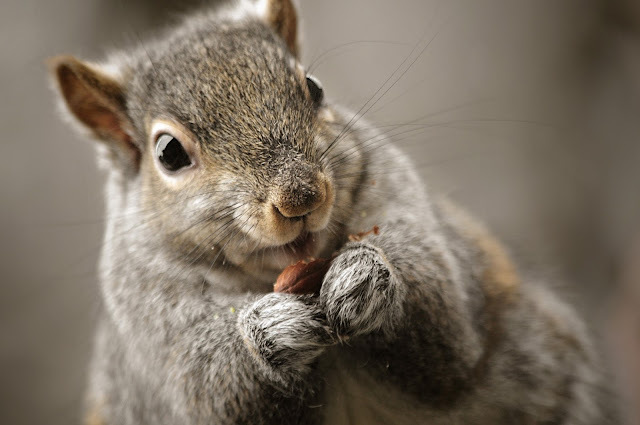 And I'm so glad that Karen visit you for some extra nuts! 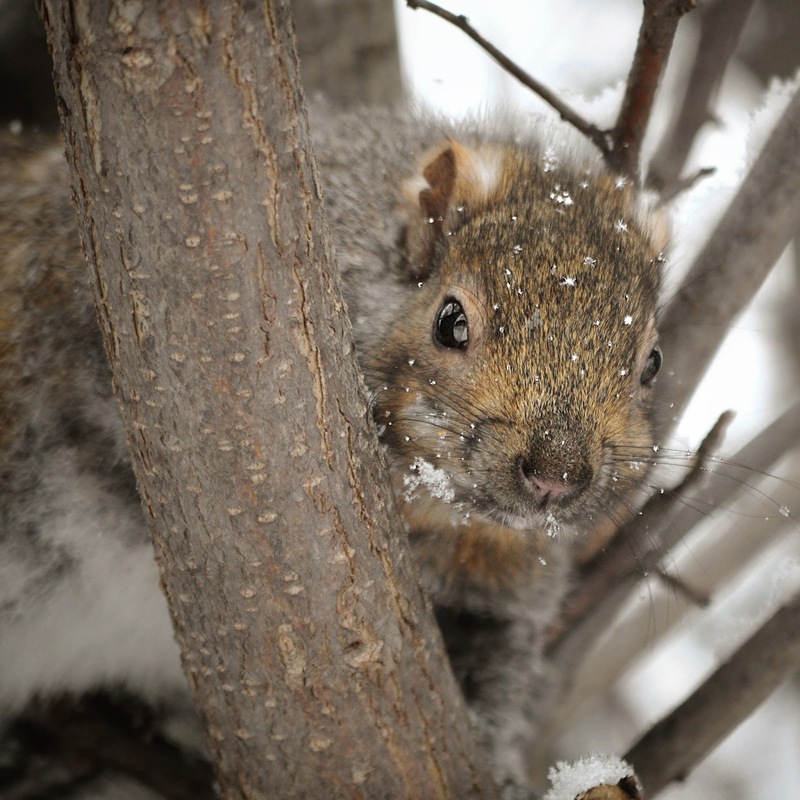 :) Hope that the rest of the gang peek out from some trees as soon as the Spring come again here. I am so sorry that this is your last, I do so love your Christmas cards! This one is gorgeous, the colours are wonderful, as is the design and I love how you matched up the words of the song.. beautiful! Gorgeous layering on your stunning card and I love the red and aqua theme on this Christmas card too. 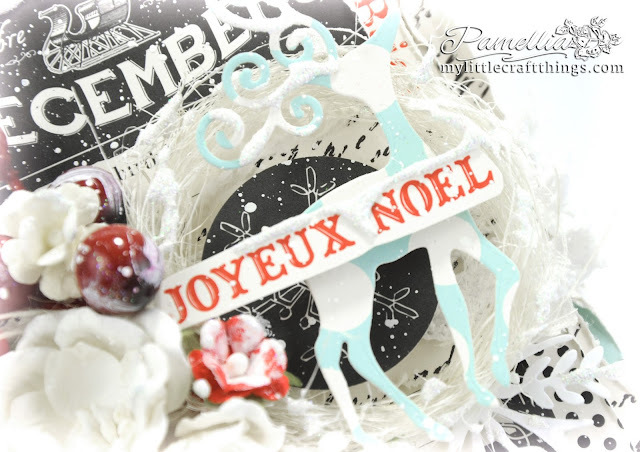 Gorgeous Christmas card Pamellia, love these beautiful papers and layers. Amazing photos you have shared again, looks like your trip was worth it. Its a gorgeous last card to share from Christmas. All the photos look fantastic, how white and calm it all looks with the fresh snow. Its good to see the sweet Karen enjoying her treats. Your card is awesome. I love the papers and all the fab layers. I can see why you are in love with the papers. Gorgeous! I love all the layers and the colours. 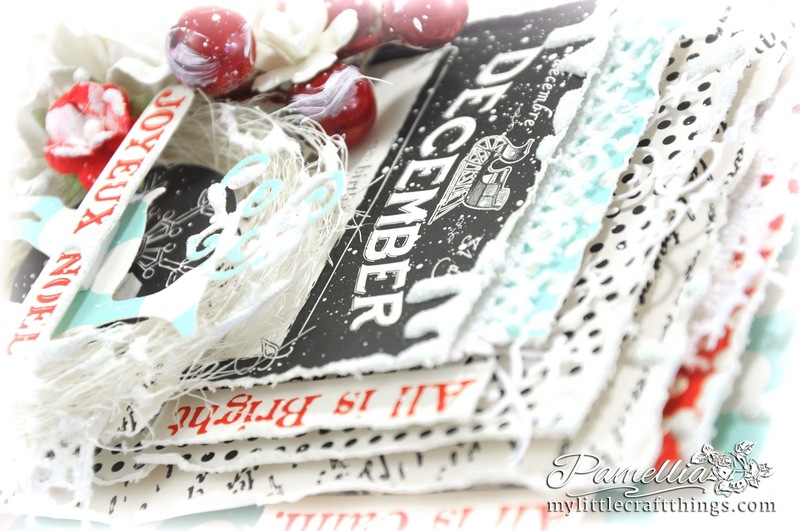 What an amazingly beautiful card Pamellia - I am in awe as to how many layers you have there!! Love your macro shot, and your squirrels are fabulous - as ever - love the little red one and the caption you gave it!! Well, Pamellia, your festive card makes me want to drag the tree back in from the curb and throw up those twinkling lights once again! Love the colors and how you've added the lyrics down the side! 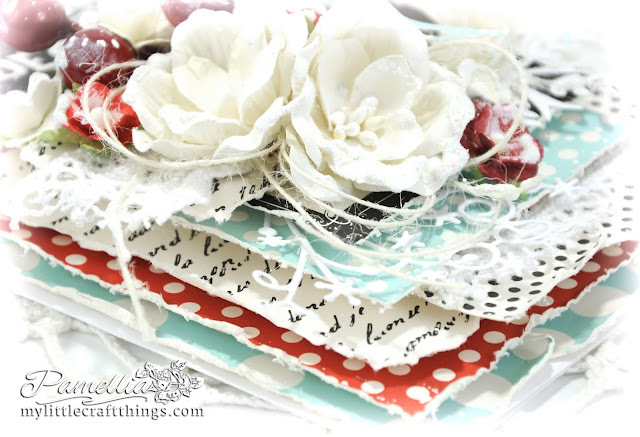 Beautifully feminine layered card in your divine Pamellia style! Your photographs are amazing and Karen is looking happy as a clam! Gotta love those snow shots--4ft!!! My word! How do you get out of your house when it's that high? Great you had some sunny weather to get some awesome snow and ice shots! We got about 232 flakes last week! Ha! Ha! We sent Lauren back to school early, since 8 inches were forecasted between here and her college, but they ended up getting an inch! We are back to summer today! Sending warm hugs! Glad to see you back in the craft room! It sounds like yo had a great trip north and you certainly found a lot of snow. The little red squirrel is so sweet and I am sure you would soon get him eating out of your hand if you had the opportunity. 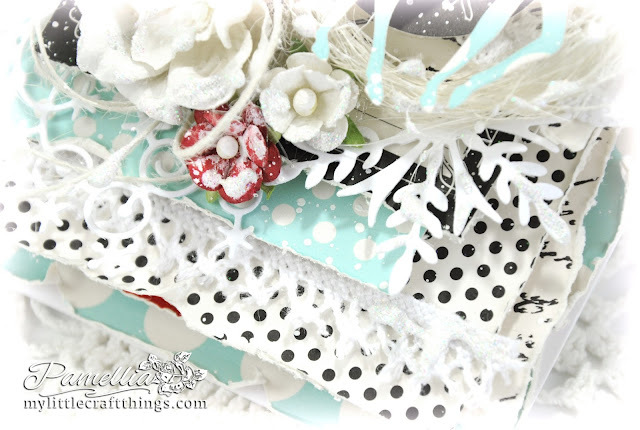 It seems sad that this is the last of your Christmas cards for the season, time to put away all of those lovely papers and beautiful Christmas charms and berries. 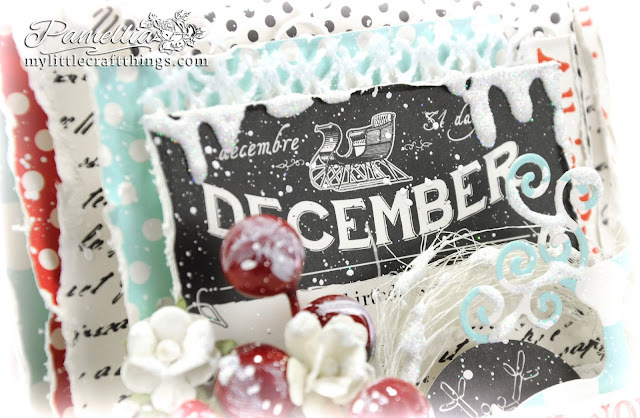 This is a fabulous card and I adore all of the layers. You did so many GLORIOUSLY LOVELY Christmas cards - super art work Pamellia. 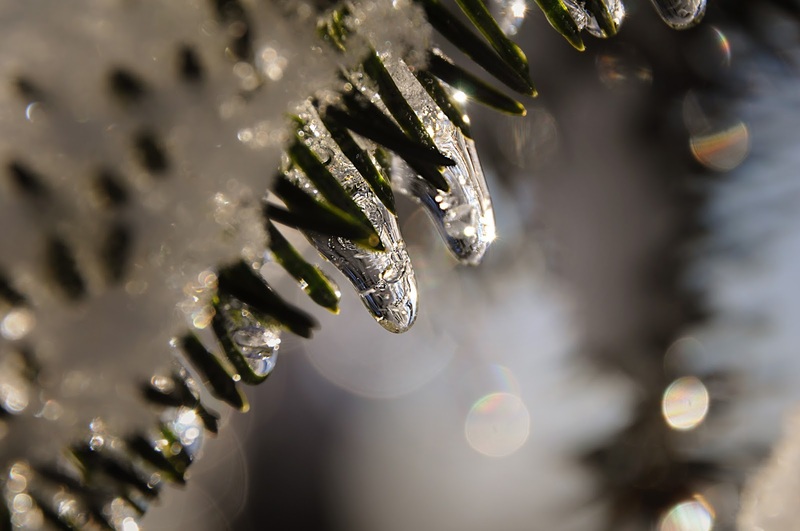 Thank you for sharing your holiday spirit in such a special way. As a Texan - I can't even imagine driving towards a world covered in ice. I would be running the opposite way!!! It's amazing to me that you love it so but I'm glad you do because you sure give us some INCREDIBLY WONDERFUL imagery to see. Your photos are just amazing. As our your adorable little friends! Xj. 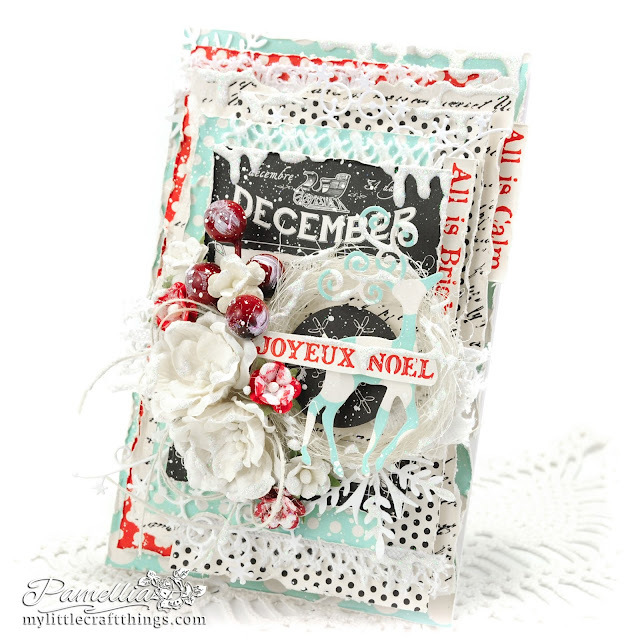 Your card is gorgeous and I just adore those colors together! Awesome card Pamellia!! The layers are wonderful and I love the chalkboard part in the center really pops :) Of course your critter shots are always amazing! So glad you didn't miss sharing this final festive card - I just love the colours here, so pretty and fresh in those fabulous dimensional layers, and the chalkboard sentiment is perfect at the heart of it all. Stunning photography as always, and I'm definitely envious of your snow compared to our grim, grey rainy days at the moment. BEAUTIFUL card, I never have enough words to praise them for all the detail and loveliness you add to them. Oh! I'm so envious of your snow, we are supposed to be having a little tonight, but looks more like rain than snow. Your photos are amazing as always, you should have them printed in a book. Another GORGEOUS card! The layers are amazing and love the patterns! The gorgeous details are just stunning! I love the deer~The sparkle looks fabulous!!! The pop of black with red and teal like colors is so pretty! Such a beauty! Thanks for all the pics..they are amazing! The snow scene is beautiful and look at those darling critters?! 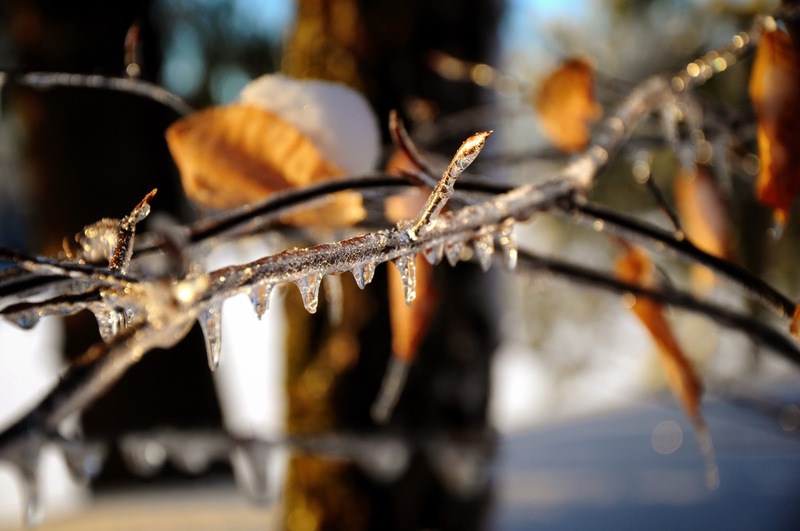 We are getting the frigid cold weather this week. It's like -13 today for a high, ugh! We have a bit of snow but still down from past years. Have a great day my friend! Layers of festive lovliness on this classy card. It's fab as always. Only you could go travelling up North to find snow lol! We had a little bit of snow today but rain too so it didn't settle. Oooooh, so bright, so festive, so fabulous, Pamellia! You made my day with this amazing color combo and a glorious layered design! You brought me back to the Christmas spirit, thanks so much for that! 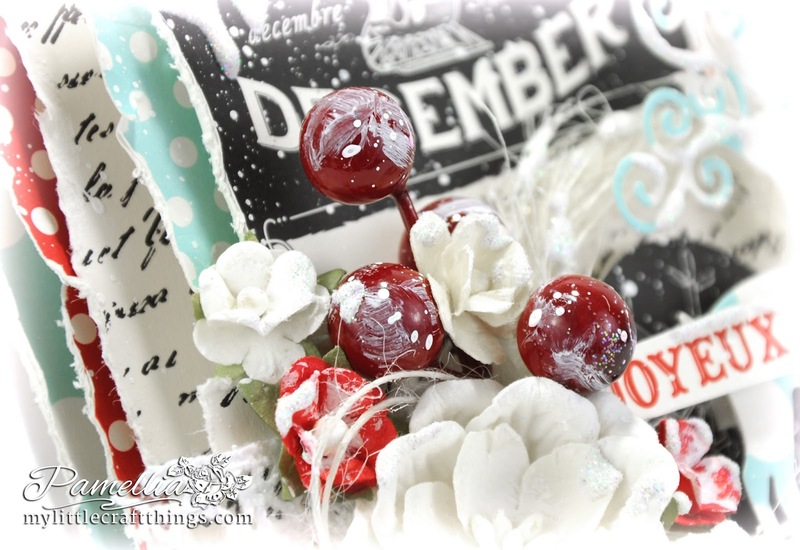 Your tucked sentiments is such a super creative idea! Brilliantly done, as always, my sweet friend! I am so glad to see that Karen visited you! So cute! Your macro for today is absolutely fantastic! Oooooh, what a treat for the eyes! LOVE your photography! I just love it when you use such striking and unexpected color combos. Bless your heart for showin how it's done! You rock! Love the layers of course and all the little tidbits you added. You journey using papers is always a sight to behold. Beautiful and gorgeous and festive and perfect! MANY THANKS: I would like to thank you for taking the time to visit my blog. I get my inspiration from many places, so I send thanks to the very talented people who spark my creativity. Whenever possible, I will give credit to those who inspire me and I ask that if anyone is inspired by my creations, that you please do the same. I do hope you enjoy! ZOOM IN: To view super-sized images, right click on any image and then click 'open link in new tab'. DON'T FORGET: all smears, smudges and blobs were intentional and are part of the 'my little craft things' experience. Pion Design - Soft as a Songbird!